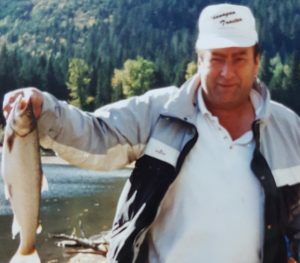 Gerald “Gerry” James Stock, age 77, of Salmon Arm BC, passed away on February 10, 2018 at Royal Inland Hospital, Kamloops, BC. He was involved in a serious vehicle accident on January 15, 2018 in Salmon Arm, suffering several internal injuries from which he was unable to recover. Born in Loon Lake, Saskatchewan on August 19, 1940, Gerry is survived by his daughters Cindy (Keith) Latimer of Victoria, BC, Cheryl (Warren Wall) Stock of Airdrie, AB; son Jim (Tracy) Stock of Calgary, AB; granddaughters Amanda Stock of Airdrie, AB, Devon Wall of Airdrie, AB; grandsons Brad Stock of Calgary, AB, Colton Wall of Airdrie, AB; great grandson Carter Stock of Airdrie, AB; and by his sisters Valerie Garstang & Leona (Ray) Dieno of Saskatoon, SK. He was predeceased by his father James Stock and mother Tassie Stock (nee Bender) of Young, SK. Gerry was a successful salesman specializing in heavy equipment for many years, in later years he owned and managed Okanagan Tractor in Vernon, BC. In his retirement years he spent time in California during the winter months. Gerry always needed to be kept busy. He enjoyed gardening, working around his yard and puttering around in his workshop; building, fixing and modifying things. He was a gifted negotiator and he assisted his children in buying vehicles and property many times over the years. When his daughters were getting their first vehicles, he ensured they were “road ready” and made them learn all the necessary things to be safe on the road and how keep the fluids etc. topped up. Sending my love and condolences. I am daughter of Mary Dyc (Stock), grandaughter to Harold and Josephine (Bader, nee) Stock.